Merfangle is a record company created to promote the work of the remarkable Clarinet & Saxophone virtuoso Julian Marc Stringle . Merfangle launched with the ‘smooth jazz’ album ‘Sundance’. They followed with two jazz-funk albums ‘LA Sunset’ & ‘Blues for the Morning After’ by Julian & his Latin influenced ‘Dream Band’ before releasing his vocal debut album ‘A Time for Love’ . 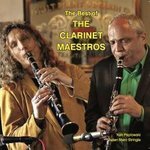 Last year Merfangle released ’The Best of the Clarinet Maestro’s’ featuring Julian & renowned USA Clarinet & Sax star Ken Peplowski backed by Pianist Craig Milverton’s Trio . Julian’s latest release is the first of two ambitious ‘It’s Clazzical’ albums . ‘It’s Classical’ Volume 1 features original arrangements of classic melodies by ;- Bernstein & Sondheim, Piazzolla, Dankworth, Stratta, Mangione, Villa Lobos, Lennon & McCartney, Hubbell & Stringle . In 2019 Merfangle will release Julian’s long-awaited ‘live’ album recorded with the Dream Band and superb vocalist Jacqui Hicks at the Chickenshed Theatre and ‘It’s Clazzical’ Volume 2 . Due to popular demand we might well have to re-release Julian’s debut vocal album ‘A Time For Love ‘ too ! We are a dynamic new Record Company created to nurture the work of exciting, innovative and seriously talented artistes.